What a treat it is when you get a package in the mail unexpectedly! My friend, Rose Anne, is a fabulous tatter and I am tickled pink with this Peacock Feather Bookmark she created and sent to me. Isn't it gorgeous? Thank you Rose Anne! What Does AAQI Do With the Money? If you have ever wondered where the money the Alzheimers' Art Quilt Initiative is spent, read on! I am attaching information here I have just received from AAQI. You can read this and more on the site! 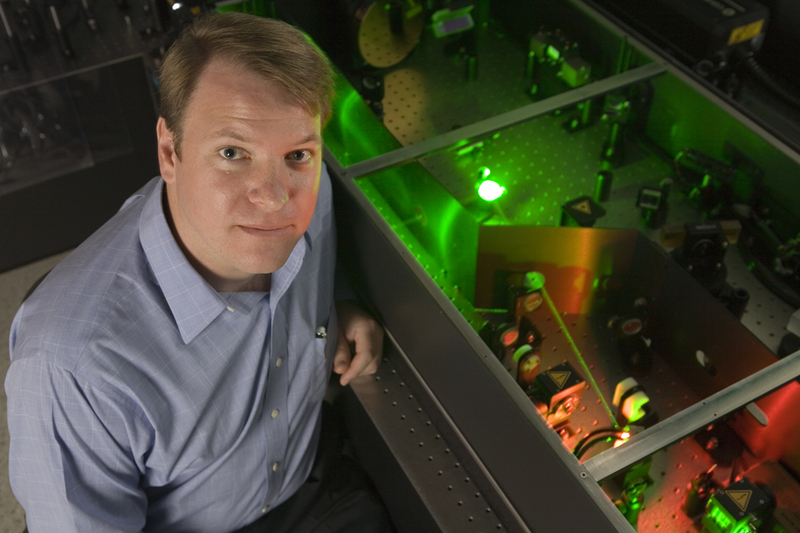 The Alzheimer’s Art Quilt Initiative (AAQI) has awarded its ninth grant to Dr. Chris B. Schaffer, Professor in the Department of Biomedical Engineering at Cornell University. The $30,000 grant is the second grant the charity has awarded for Alzheimer’s research at Cornell University. Dr. Schaffer explains his work: “In the conventional view of Alzheimer’s disease it is thought that neurons in the brain are damaged by the accumulation of a small protein called amyloid-beta, but recent work shows that the blood vessels in the brain are also affected by amyloid-beta. In addition, Alzheimer patients have less blood flow in their brains than people without the disease. It is possible that the vascular effects of amyloid-beta and this blood flow decrease could contribute to the symptoms of Alzheimer’s disease and add to the impact of the direct neuronal damage by amyloid-beta. Our work suggests that the blood flow decrease may be caused by white blood cells that block small blood vessels in the brain. Normally, white blood cells become activated, stick to the wall of blood vessels, then exit the vasculature and tissue in response to an infection or injury. However, in Alzheimer’s disease such activation may be detrimental because it could slow blood flow and deprive brain cells of oxygen and nutrients. In addition, the decreased blood flow may trigger the accumulation of more amyloid-beta, producing a vicious cycle of injury to the brain. Witch Finger cookies are a tradition at my house for years and years and this time around my daughter made the batch for us all to enjoy! Creepy and yummy - a great Hallowe'en combination! If you would like to make asome of your own, the recipe is available at Canadian Living website here. 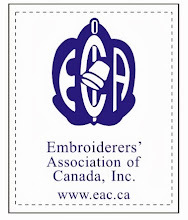 Sometimes I mention EAC here, which refers to the Embroiderers' Association of Canada. (If you are from the US, you can equate EAC with EGA.) I thought it might be interesting to share a little about this group. 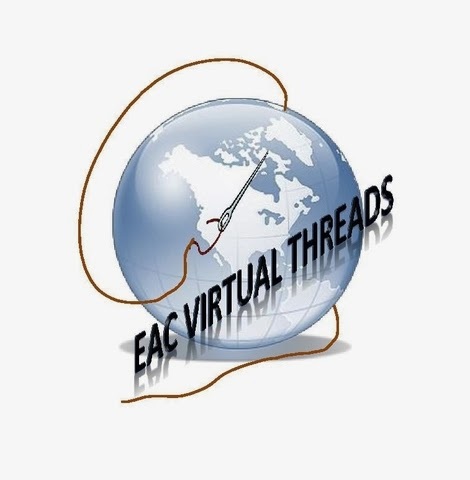 EAC is a national non-profit educational organization whose purpose is to have a fellowship of persons who enjoy needlework and wish to learn and share their knowledge; and thereby work towards maintaining higher standards of design, colour and workmanship. 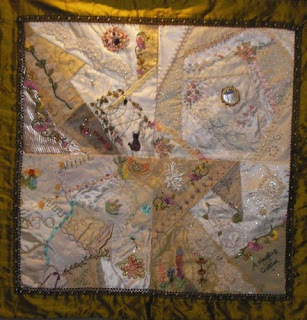 EAC's aim is to preserve traditional techniques and promote new challenges i the Art of Embroidery through education and networking. You can learn more about EAC by visiting their website. EAC is made up of numerous Chapters which are located across Canada, and in additional there are a number of Youth Chapters. You can join EAC either as a national member if you are not affiliated with a specific Chapter, or if you join a Chapter your membership to EAC is included. I first joined the Calgary Guild of Needle & Fibre Arts (CGNFA) over twenty years ago and I have never regreted that decision! In the years I have belonged I have benefited from many workshops and classes and have attended EAC's National Seminar three times. Last year's Seminar was held in Sackville, New Brunswick, and next year it will be in Victoria, British Columbia - from sea to sea! I have also been able to attend Olds Fibre Potpourri (an event hosted in alternate years by the Chapters in Calgary and Edmonton) numerous times and have learned even more there. It is so exciting to me to have the opportunity to learn and explore new techniques and different forms of embroidery. So, the reason I decided to tell you a bit about EAC is because I think these organizations are very important. There is nothing like interacting with other stitchers in person, seeing what other people are working on, learning and growing together. 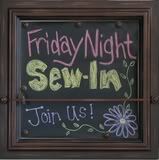 So, if you don't belong to a group yet where you actually go out and meet with other stitchers - give it a try! This is the latest foolishness at our house - dd and I have been making Hallowe'en candy! I bought one of these Wilton molds and some candy melts and we had a blast with them. The ones with the faces are dd's - I am not so adventurous - I just fill the molds up with a solid colour. These were fast and easy to do - the hardest part was finding the big pretzel sticks! One of the enduring joys of living in such a small community (population - 70) is that you can give out handmade goodies for Hallowe'en because everyone know where they came from. Of course, the downside is the largest turnout we have had in the last twenty years is 10 kids trick-or-treating! Doesn't matter to us though - we have a lot of fun decorating anyway for the holiday. I love Hallowe'en! Over on Stitchmap, there was a great link posted to a tutorial on Idle Hands Empty Brain to make the cutest little thimble holder! Check it out! This is my first attempt and I have to 'fess up and tell you I blew it - it doesn't work. It won't close so it isn't really being held open by the thimble like it appears. I love this little project though so I will be giving it another try. 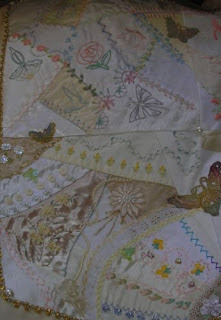 It's a nice green project too, using very small scraps of fabric and things you would usually throw out. I spent Friday night and today working on and finishing up Ruby's project for the UFO Challenge. It's a thread roll. This is what it looks like unrolled. Ruby had started it and I finished it so, thanks to this challenge, one UFO off her list. I can't wait to get mine back from her and see if she had as much fun as I did. 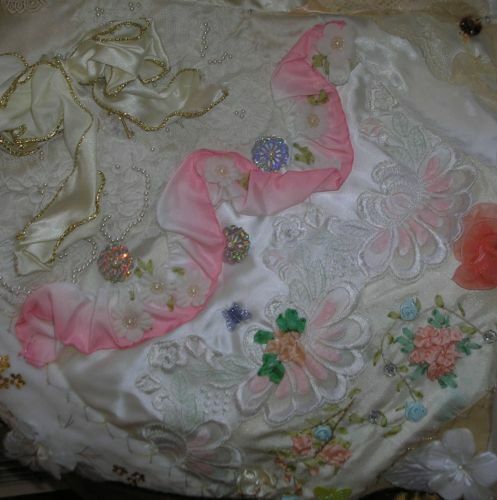 Ruby already had this gorgeous purple lace motif on there and some of the leaves. I added more leaves including some SRE ones and the sloppy french knot ribbon flowers. Ruby had the gold butterfly on here already and some of the feather stitch in the background so I added more feather stitch and a second blue butterfly. 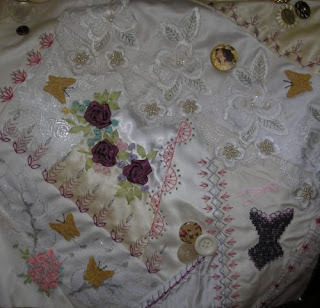 There was a little section at the bottom where some stitching had been taken out so I covered it up with my favourite vintage lace trim, added beads, crystal butterflies and butterfly charms. These are the buttons Ruby had on there but I kind of moved them around a bit. This is the inside of the roll when it is open. You can see there are rings sewn at the top for you to loop your threads on before you roll it up. I got the matching needlebook finished as well. I added a few seams and motifs and did the construction. This is the front. This is the back of the needlebook. Inside there are four pages for your needles as well as a lace pocket on the inside of the front and back covers to hold packages of needles. I thought I should get my FNSI stuff posted before Saturday was over! 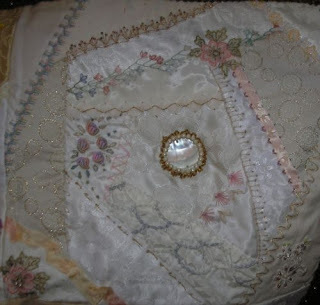 It is Thrifty Thursdays over at The Quilted Cupcake and I thought it might be fun to get in on the fun and show off one of my thrift store finds - not the pincushion in the top picture. That one was made by my dear friend, Jacque, and I won it in the auction last year at the CQI retreat. I love it! I included the photo so you can see the possibilities of my thrifty find below. It's a larger version of the one I have and needs some pegs replaced that are missing. Of course, it needs upholstery (cq of course!) added as well. I just have to share this find because I paid - are you ready? - 45 cents for it! Whoo-hoo! This is a needlebook which is one of two items I am working on in the UFO Challenge at CQI. This is a fun challenge! We all have so many blocks and unfinished items of cq so we swapped them and each to get to finish one someone else did and then send it back. This needlebook is one of two items I got from Ruby. 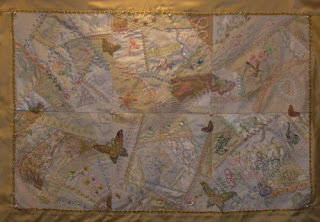 I have finished all the stitching on it and started putting it together now. Next is a thread roll which matches this. Hopefully I will have that finished up in the next day or two as well. I worked on both of these at retreat and they were lots of fun - great colours! Well, the photo isn't much but it's late and I don't want to fiddle with the camera anymore! lol This is the redo of my Retreat Challenge Round Robin Block, made smaller and embellished further and now ready to head off in the mail to AAQI, the Alzheimers Art Quilt Initiative. Hopefully it will make a few dollars to further Alzheimers research. This one is called Spider Webs for Luck because it has two spiders and webs on it, a Victorian symbol for good luck. 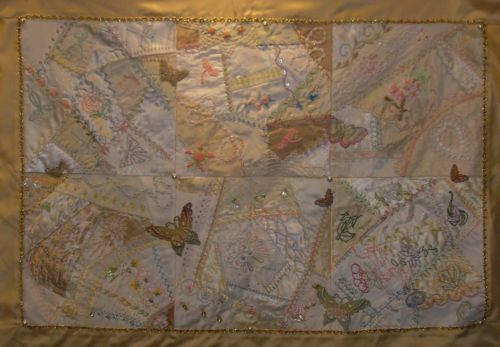 If you aren`t familiar with The Alzheimers Art Quilt Initiative - please check out their website. These volunteers do good work! Also, take a minute and "like" them on Facebook if you would please! Thanks! Where here is what my little craft session on the weekend started with: some black paint, a set of stacking boxes from the thrift store and some spooky green lettering. And here is what I ended up with! I have been seeing such wonderful Hallowe'en boxes on different blogs around, I couldn't resist a bit of fun of my own. I started by putting a couple coats of black acrylic paint on the boxes and then sprayed them with acrylic sealer. The "trick or treat" was glued on with very cute green sparkly and spooky lettering. Lastly, I tied some spider web ribbon around each box and added a black bird to two of them. Fun! Friday Night Sew In - this Friday coming! With Christmas sneaking up, the Friday Night Sew-In seems like a great idea! I always try to take part in this event but usually end up forgetting. This month I have a sticky note up on the computer screen so I should actually remember to get something done. I like the idea that there are lots of ladies all over stitching away at the same time. So, this Friday, I'll be working on some Christmas gifts that I need to get working on. I'll blog about it again on Saturday and tell you what I managed to get accomplished! If you would like to join in the fun just click on the link in the sidebar. I had two interviews over the telephone today and so I was biting my nails all day! Happily, both went all right and now they are over (the best part!). Cross your fingers for me that something comes from them. I've been crafting away today - yes, crafting! not stitching - and it made a nice change. I have been seeing so many cute Hallowe'en crafts on the various blogs I follow, I couldn't resist getting in on the fun. I'll show you what I've been up to tomorrow once the paint is dry. 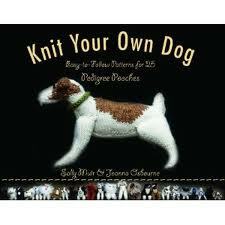 I geared up the Randon Number Generator after going through the comments and numbering them all and the lucky winner of the book, "Knit Your Own Dog, is #13: Alessandra Lace. Congratulations! I have sent you an email asking for your mailing information so as soon as I hear back from you I will get the book off in the mail. Thanks for following my blog! 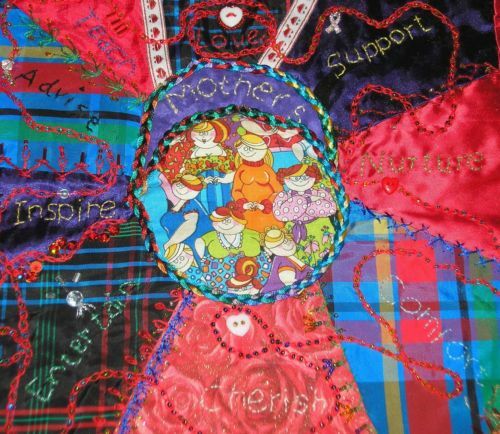 The CQI's crazy quilts for Breast Cancer have been relisted with some lovely closeup photos and more time to allow for bidding. 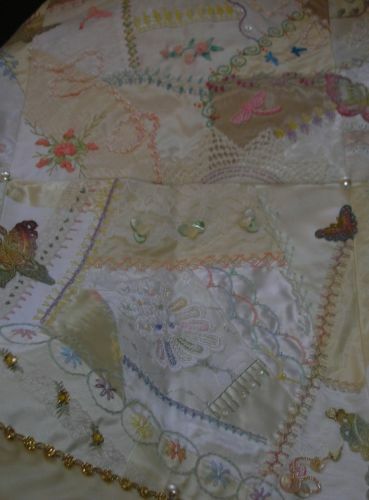 This first one, Golden Crazy Quilt for the Cure, can be seen on Ebay here. 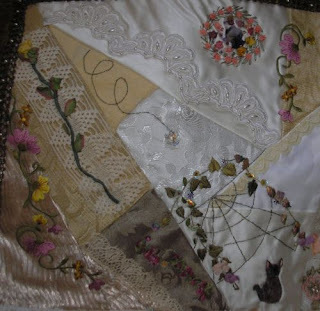 I love the little black corset in this closeup of the quilt! This block was made by Hideko in Japan. The lovely pink ribbon meandering across this block serves as a reminder for the cause we are tring to raise the money for. The block featured in this portion was created by Rose Anne B of Canada. The auction for this second quilt, Crazy Quilt for the Cure, is located here on Ebay. 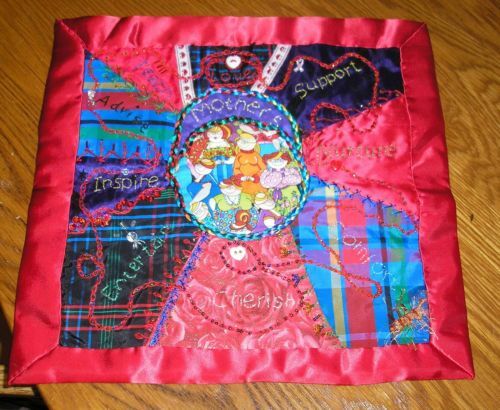 As with the other quilts, the proceeds are going to Susan G Komen for the Cure. 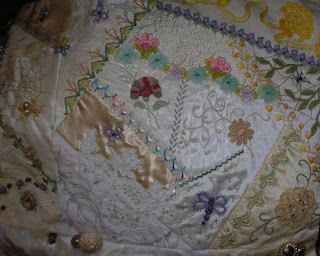 I hope you enjoy these closeups of the second quilt. The third crazy quilt up for auction is entitled, Another Crazy Quilt for the Cure, appropriately enough! Check out the auction here. Here are three closeups of this third quilt so that you can enjoy the details of the stitching. Just click on the photos to enlarge them. The 4th and final quilt in CQI's auction to benefit breast cancer is A Tribute to Mother, created by Diane Matheson of Ontario, Canada. You can see a bit more of the details in this photo. To check out the auction for A Tribute to Mother, go here. All four auctions are ending on October 24th, so please visit them today! Please feel free to borrow any of these photos or information for your own blog. Help us spread the word! Thanks! Today is the last day to enter the giveaway for this book. Go to the original post and leave a comment there. I'll be drawing a name tonight - good luck! 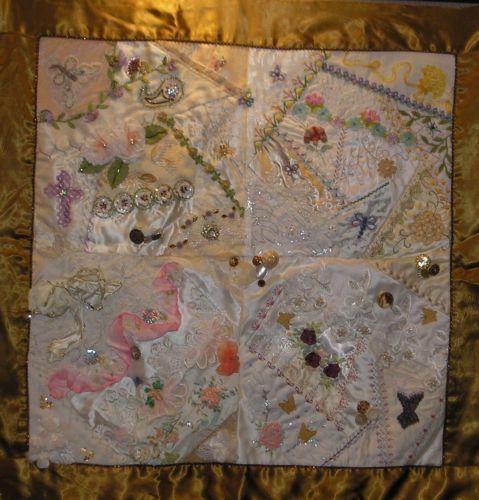 These three crazy quilt wall hangings are up for auction right now on Ebay. 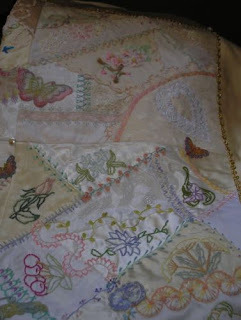 Right now each quilt is sittting at a starting bid of $50 so this is a great chance to own one of these for yourself! 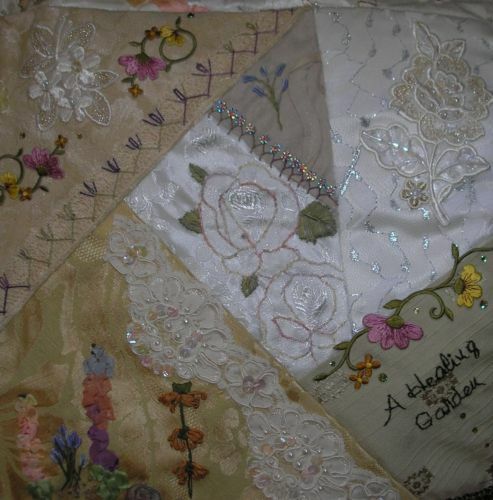 The quilt blocks were constructed by the members of Crazy Quilting International and assembled by Leslie and they are gorgeous! All proceeds will go to Susan G Komen for the Cure - Denver Metropolitan. 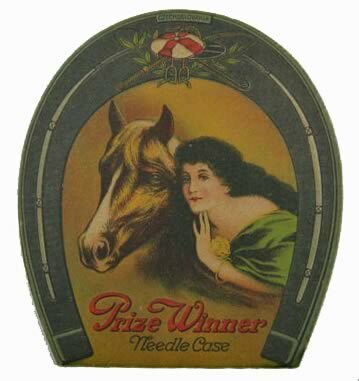 Hurry over and have a look before the auction is over in a little more than a day. The link under each photo will take you directly to the appropriate Ebay auction page. This was my block when it came home from the Retreat Challenge Round Robin. I already knew it was going to become a little AAQI quilt so was prepared for the first thing I would have to do... since the maximum size for the AAQI quilts is 9 X 12 inches and this round robin featured 14 inch blocks... I had to cut it down to size! Talk about stress! Well, I simply had to use the magnificent spider web and spider and also couldn't bare to eliminate any or the gorgeous hand dyed lace so that determined where I had to cut. Not to worry - the bits I cut off will become postcards or ATCs or find their way into other projects! So, I have been adding a few seam treatments here and there. There is still more to be done before I can back it and finish it up but I thought I would give you a peek of where I am right now. I thought I would share another of the blocks from the Retreat Challenge Round Robin that I worked on. These were some of the things I was working on the last few months that I could not share until after the retreat. This particular block was a large fan so it gave me lots of opportunity to play with seam treatments. The first one I did was very standard - a Chevron Stitch with trios of Detached Chain Stitch added. 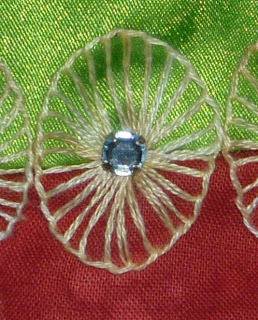 The second seam treatment, done in Gloriana Princess Petite Perle silk thread, was a simple zigzag of straight stitches with french knots, detached chain stitch, and more straight stitches added. I finished it off with sequins attached with beads. 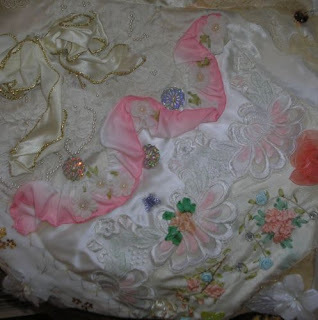 The third seam treatment, again in Gloriana threads, was two rows of box shapes built using chain stitch. More detached chain stitches in the center of each box. I found some wonderful vintage sew on jewels in the thrift store and had to find a way to use them so this is how the next seam treatment came to be. I made a row of buttonhole stitch ovals and then used one of the sew on jewels in the center of each oval. This was gone in good old DMC floss. I have to share this even though I hate it and sincerely hope it has since been removed from the block. I was inspired by Carole Samples' Daddy's Ties book (this concoction is in no way a reflection of Carole's book!) Somehow or other this is what I came up with on my own and I hope the block owner has taken it out and found a nice piece of lace or something to cover the spot! It was stem stitch, detached chain, and french knots. Anyway, this is the block when it left me and went on to the next stitcher. The fabric at the base of the fan was the challenge fabric and I think whoever pieced this block did a wonderful job working with it and using all the colours. It was a great block to work on! Missed a Day but Happy Thanksgiving! Blogtoberfest #5 - I`m Pouting!